Good morning! 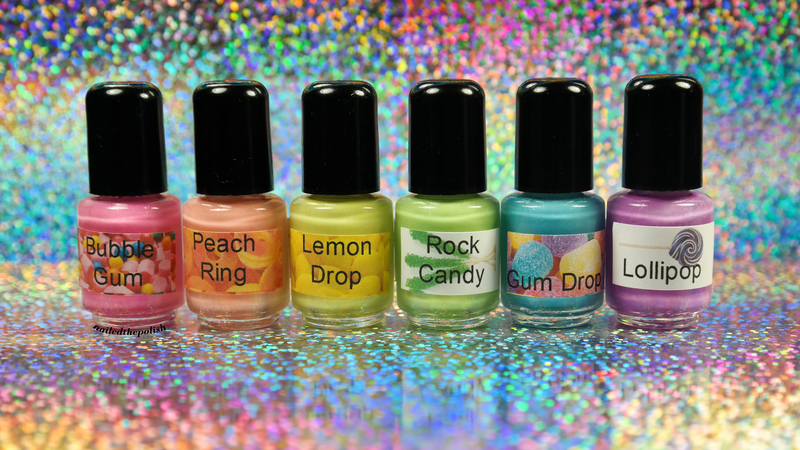 Today I have swatches from Vapid Lacquer‘s The Candy Shop collection that releases tomorrow (2/21) morning! This collection consists of six pastel neon polishes – think Maybelline’s Bleached Neon polishes but BETTER! Why are they better? Well for one you don’t have to run around like a maniac visiting all of your local drugstores in hopes that there is a set available, two because they have hints of HOLO throughout (Yay for holo! 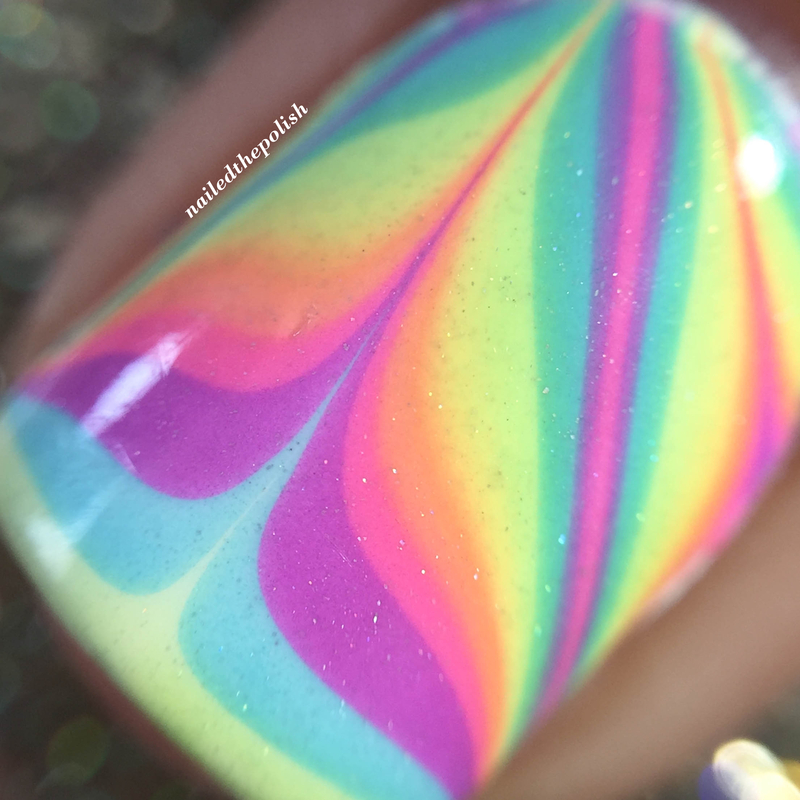 ), and three they watermarble like a dream! Aren’t these labels just the cutest!? All swatches are two easy coats with top coat and were taken in indoor lighting. Accent nail has a white base and was done using all six polishes from the collection. Bubble Gum is a creamy bubble gum pink pastel neon with subtle holo shimmer. This shade is to die for! It makes me smile and feel all bubbly inside! Peach Ring is an orange leaning peach pastel neon with subtle holo shimmer. So soft yet so vibrant – just like peach rings! Well, the good ones at least! 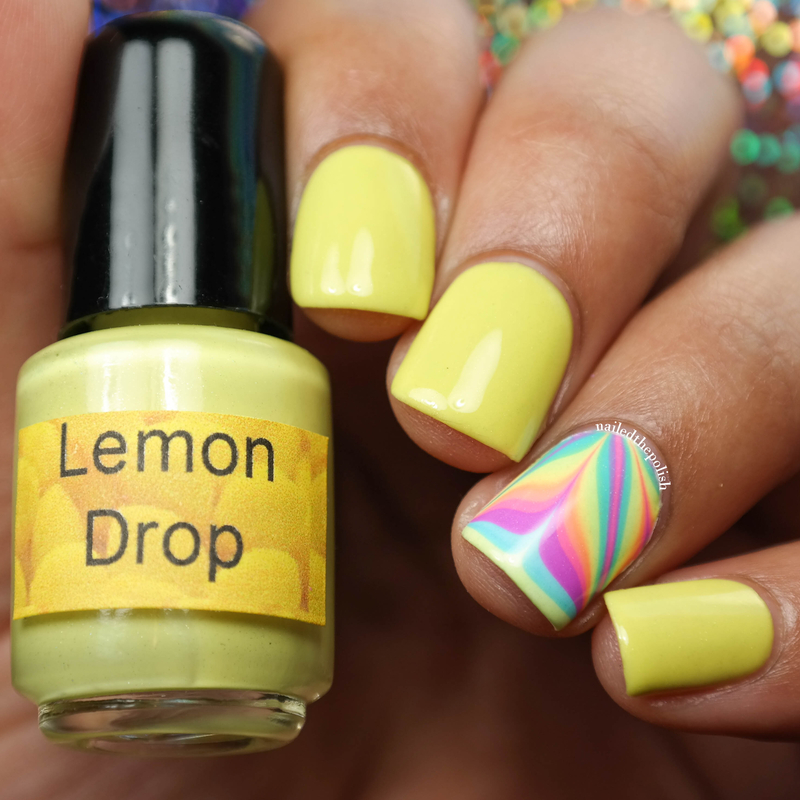 Lemon Drop is a bright lemon yellow pastel neon with subtle holo shimmer. Great consistency, great shade, great application – Two thumbs up! 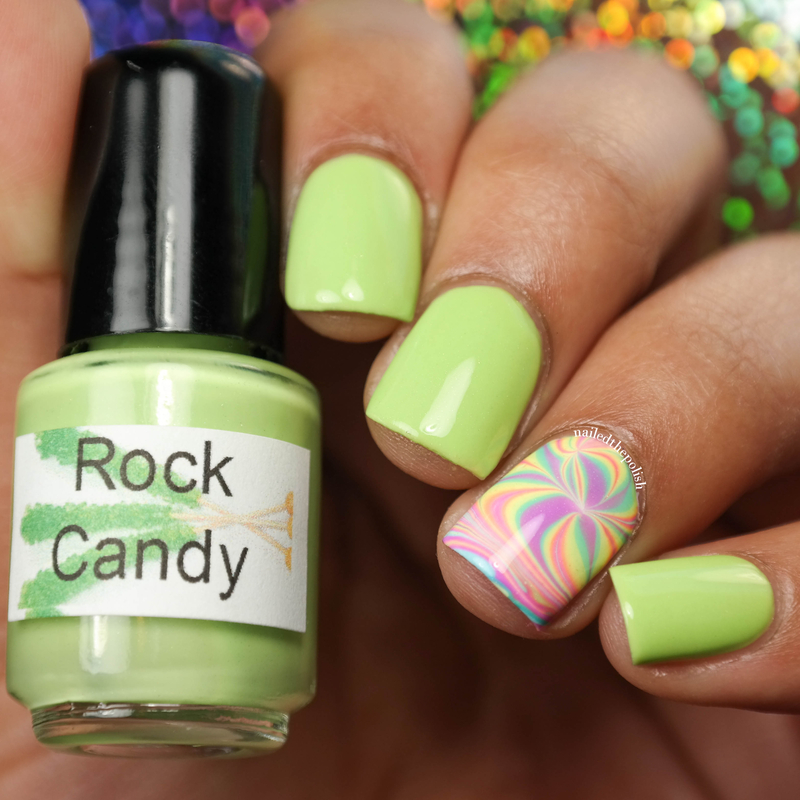 Rock Candy is a lime green pastel neon with subtle holo shimmer. My skin has olive undertones so I was worried that this polish would bring them out but it doesn’t! This shade is so fun and perfect for spring! Gum Drop is a vibrant sky blue pastel neon with subtle holo shimmer. This is my favorite shade of blue so of course I am obsessed with this polish! It’s one of those colors that looks great on all skin types. Last up is Lollipop a grape pastel neon with subtle holo shimmer. Another beauty! It’s so perfect, so yummy – I want to eat it! I’ve died and gone to candy watermarble nail polish heaven. Let me tell you, it’s beautiful here and you all need to join me! My favorites would be Bubble Gum, Gum Drop, and Lollipop mainly for the fact that the holo is more prominent in these three colors and, as you all know, I am a complete and utter sucker for anything holo! This collection releases tomorrow (2/21) morning MST and you better set your alarms because I have a feeling that this collection is going to go fast! They will be available for purchase here. 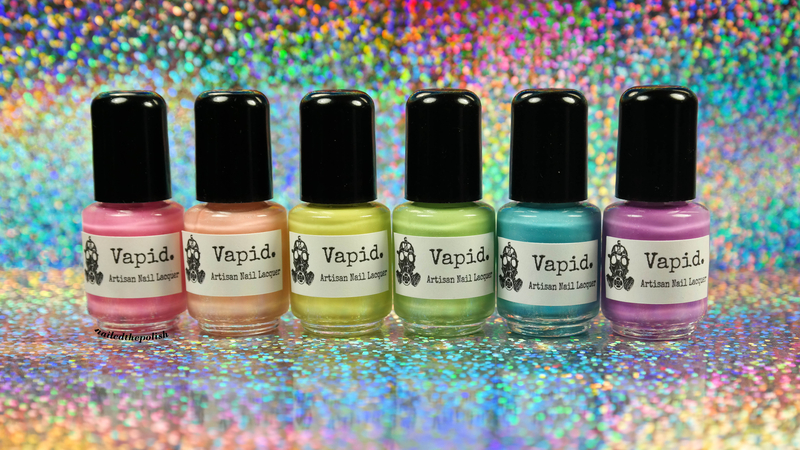 In the meantime, you can check out Vapid Lacquer’s Facebook, Twitter, and Instagram for more swatches – just make sure to have a napkin or two because they’re totally drool worthy.